This review has been a long time coming. 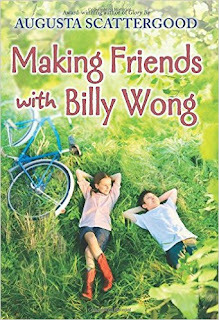 I read Making Friends with Billy Wong several weeks back but just hadn't gotten around to writing up my thoughts. I have nice thoughts about this book on the whole. Honestly I'm never sure what to expect from Scholastic Books; much of the time it feels like they are just peddling books because they think the reading public is bored and will read anything. (I'm nothing if not honest. You have to give me that much!) Every once in awhile though they publish something that seems worth reading and Making Friends with Billy Wong seemed to me that it might be one of them. I really think it is. This story focuses primarily on the character of a young girl named Azalea. Her mother drops her off to stay at her grandmother's house after her grandmother suffered a fall which has prevented her from being able to care for herself. The last place in the world that Azelea wants to be is at her grandmother's. To begin with, she doesn't know her grandmother as her parents have never took her for a visit. Secondly, she is an introvert who has a hard time making friends and doesn't really know how she is to pass these summer months. On the flip side of things, Azalea's grandmother has high hopes for her granddaughter's visit. While she does need help around the house, especially in the garden, she has long wanted to spend time with her granddaughter. If you read between the lines, she truly is grateful for the opportunity to get to know Azalea. Alongside Azalea there are other children from the local neighborhood coming to help in the garden, including one Billy Wong. 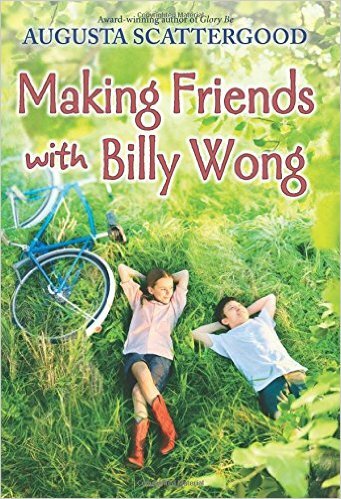 Making Friends with Billy Wong is a story about family and relationships in part. Primarily though it is a vehicle to explain a piece of history to young readers. This story is set in the 1950's when Chinese students were not entirely accepted into white schools. Segregation was still the name of the game at the time of this story. Billy has moved to his uncle's in order that he can attend the white school in town, something he is unable to do in the town where his parents live. Although not readily accepted even in this new location, he is both excited about and grateful for all of the possibilities that his new school will offer him. Most of the story revolves around the friendship of Azalea and Billy. As mentioned, the point of the book is to teach young readers what life in America looked like for minorities during the 1950's/early 1960's. It is a look at a way of life. What would it be like for a white girl to befriend a minority? What would integration into a chiefly white society look like for a person of Asian descent? These and other questions are raised in the reader's mind as they make their way through this tale. Augusta Scattergood is a decent writer who has a passion to share this portion of history with young people. The story is told well enough, although I wouldn't say that it's brilliantly written. Parts of the book feel rushed and a variety of details are overlooked. Still, for a short story which wants to serve as an introduction, it works. This book makes for very easy reading, coming in at roughly 200 pages. Simple and sweet, it does open the reader's eyes to the status of minorities both in the 1950's and also in today's society. An interesting read, I wouldn't avoid it but would happily point it out to anyone looking to introduce their kids to the concept of racial tensions and life in small town America. Many thanks to Scholastic Books for sending a copy of this title my direction in order to facilitate this review. I received no additional compensation. If you sincerely doubt it, please let me assure you that all opinions contained in this post are entirely my own.